Hi Lumberjocks community. I could use a little help here with getting my Makita cordless track saw running properly. I am having trouble with getting the saw to cut a 90deg edge. A little background. I purchased the saw new a couple months back and put it to work right away cutting up some MDF into strips for trim work. Once I got past aligning the two rail sections all seemed to be going well. I did not notice until later that the saw was not leaving a 90deg cut edge and that the surface was a little rough. Adjusting the cut for 90deg seemed easy enough using the setscrews on the bottom. Through research on line I found the rough cut may be due to improper toe in adjustment. A call into Makita and some finagling I was able to obtain the factory adjustment procedure. Since then I seem to be chasing my tail between adjusting the saw for a 90deg cut and proper toe in for a smooth cut. This last go-round I felt like I had toe-in adjusted well as it seemed to measure out well according to info I could find from the Festool crowd and was leaving a nice cut. However, I have come to an impasse while attempting to adjust the saw to 90deg. I am using a slab of wood ~1-3/4” thick to make the measurements. This strategy was suggested to get the best readings for the toe-in adjusted. I was making cross cuts, checking with a square and making adjustments to the saw. Repeating as necessary. Last night I noticed that in attempt to get to a 90deg cut that my blade was actually having to be adjusted to ~85deg to the saw’s sole plate. Frustrated I walked away from it and ready to sell off the saw. Thanks for any assistance with this as I am about ready to give up on it. One thing I would inspect closely is the blade. Possibly it has some dulling of the teeth on one side. If the blade is good both sides then I would set the 90 deg vertical with a good square, then I would go back and set the blade straight inline with the guide being sure not to allow the teeth to interfere with the straight edge. I’m surprised that you would have had to change the tracking of the saw. Thanks BlasterStumps. The blade is still in excellent shape as I have only cut up a couple sheets of MDF a couple of cuts in cherry and whatever cuts I have made in the slab I am trying to use for adjustment. The cordless does use a very thin kerf (.05709”/~1.5mm) blade so I was wondering if deflection was causing the rough finish I was seeing. Unfortunately I headed down the path of making adjustments so I will have to follow it through to completion. I am planning to do as you say, set the blade to where I know it is 90 deg vertical and go from there to try to fine tune the tracking. 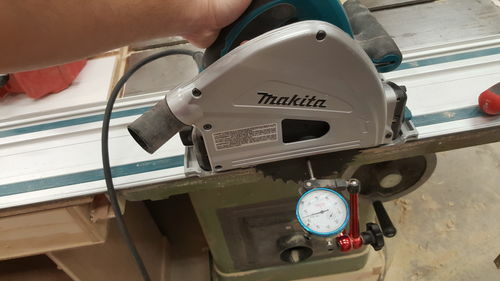 Makita’s initial response was that this is not adjustable on the saw. After continued conversation with the rep he sent me a couple pages from the service manual. It appears that Makita recommends no toe-in while Festool recommends ~.006”. I would just like to get the saw to where it can give me clean square cuts on sheet stock since my reason for purchase was to not have to lift full sheets of MDF onto my table saw in my small shop. If there are limitations on thicker stock I may have to live with them. The stock blade, in my experience, does not give good results in thick stock. I would adjust and test it using 3/4 stock rather than the slab. That high tooth, thin blade cutting the slab could very well be deflecting as you suggested. I have not had to make any adjustments other than the 2 knobs for snugging the saw to the rail. Thanks for the advice BlasterStumps. I am going to go back to ground zero squaring up the blade and attempting to remove the toe-in as best as I can. And tweak from there. I feel like I should find a use for all of the slivers I have shaved off trying to adjust this saw. Rob – Do you have any suggestions on blades? I was actually quite surprised in how well the stock high-tooth count blade handles the thick cuts. I am sure the super-thin kerf has a lot to do with that. I imagine the Makita engineers went that route to keep the cordless from feeling under powered. But it is very flimsy. I was wondering if one of the blades for the corded model would give me more solid cuts. I am sure it would affect the run time but it is not like I am doing production work and I have a couple of extra batteries to keep charged and running. Thanks all for your suggestions. 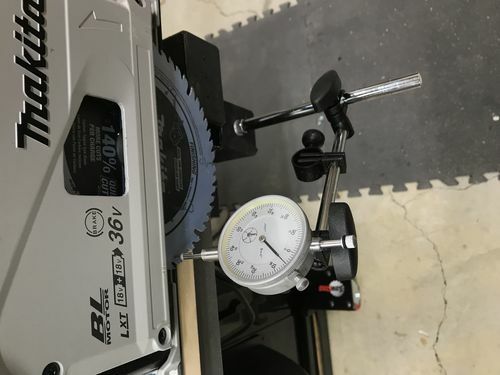 I took some time this past weekend and set my saw back up to be square with the plate and verified it against the cut surface while on the track. This required removing the blade guard which is only five screws. The saw is cutting very good on sheet goods, about perfect on MDF, but is still a little rough on hardwoods. I think I will need to research other blade options for ripping wood. The Makita descriptions for blade use leave a bit to be desired. Any suggestions would be appreciated. When ripping hardwood I get a bit of blade chatter from the rear of the blade which you can see in this pic. The stock blade is very thin so I think this is just a symptom of blade flexing. Timing was perfect and I saw a tip from jar944 on Instagram for using a dial indicator to set toe-in. I used the same setup to get my blade to be exactly .005 toe-in. Cuts and measurement of remaining pieces show this to be fairly accurate given the blade width and kerf. I hope this is helpful to anyone else who may be experiencing similar issues. I am liking my Makita cordless track saw again! I was just about to post up the pics from IG to this thread, lools like don’t need to..lol. im glad it helped. Jared, I was not sure if you were on here. Please post away. I was really getting down on my saw as I was struggling to get it cutting right. Seeing your post on IG was a real shot in the arm for me and gave me the inspiration to press on. Messing with paper, cards, and feeler gauges between wood and a flexible blade had me at my whits end. Your idea made me realize I had the tools necessary to more accurately measure. Thanks for that!! A rip blade may help, not sure if Makita makes one for their track saw though. I have the corded but assumed it was the same blade. I could be wrong. I have not purchased a rip blade yet, but have been looking at the slightly smaller ones for the Festool saws. Makita does make a 165mm one. The cordless does come with a different blade than the corded model. It is a 56 tooth ATBR. I have seen the blade you linked to but was not sure how good of a cut it would provide given the “Framing” designation on the blade and it is ATB rather than the flat top/raker as is standard on rip blades. I may just end up going with one the Freud offerings. For some reason they only offer 160mm blades in the US. They do have 165mm blades available in the UK. Apparently Axminster offers shipping to the US but I have not looked into how cost effective that would be vs losing <1 /> cut depth. When using the stock Makita blade on my corded Makita track saw, I had a similar problem. In my case, I was trying to get glue-ready straight-line rip cuts, but they were coming out slightly banana-shaped. After verifying that my track was straight, track-adjusters snug, the saw’s toe-in was set at zero, etc., I also began suspecting a blade-dynamics problem. This led to a whole lot of experimentation on 3/4” MDF, and I finally found a smoking gun. With the track clamped to the workpiece, I found that that if I first made a skim cut, the kerf line was straight. When I followed that with a normal through cut, the cut line would enter the workpiece at the skim cut, but drift a bit more than 1/64” outboard of the skim-cut by the time the blade was fully engaged. The through-cut would then taper back in toward the cut line at the very end of the cut, as the saw blade was exiting the cut. But if I did a plunge-cut in the middle of the workpiece, the blade would cut exactly on the skim-cut kerf. The blade had very little use, but it did have a bit of pitch buildup. So I cleaned it thoroughly, inspected for noticeable wear or damage, and then re-tested. The results were exactly the same. Then I found a video on YouTube where another guy had a similar problem. He bought a different blade, and the problem disappeared. So I sold my first-born son and bought a Forrest WW16507100, which is a 160 mm blade with a 3/32” kerf. It has a thicker plate, not to mention a huge amount of carbide in the teeth. I put it to the same test, and the cut-line drift problem was completely gone. A good straightedge and feeler gauges confirmed that the cut line was straight to within 0.003” over a 3’ cut—possibly even a bit better. 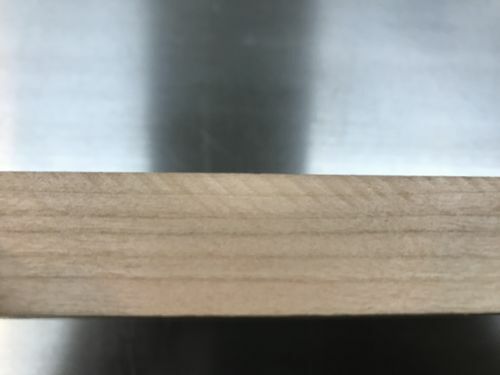 And for the first time, I was consistently getting square edges—at least to within my measuring ability on 3/4” stock. Dennis, Sorry to hear you also had the same types of problems with the stock Makita blade. Glad to know I am not the only one and that you were able to find a solution. I was not aware that Forrest made a blade for the track saws, will need to check that out. Not sure how the cordless model would do with a blade that heavy though. I see that Infinity also makes 165mm blades but they seem to be more for sheet goods. The Festool 28 tooth blade looks like it may be a good option for ripping and the cost is not horribly high. For the most part I believe the stock blade will be fine since the primary reason for acquiring the saw for me was to cut down sheet goods.